There is a large hype about children seeing a pediatric dentist until they reach adolescence or their teenage years. However, at Gold Hill Dentistry we are firm believers that children receive many benefits from seeing the same dentist as their parents. At Gold Hill Dentistry, we are proud to offer or exceptional dental services for patients of all ages. Our gentle approach to dentistry will make even the youngest patient feel at ease. Gold Hill Dentistry has worked hard to ensure that we have created a warm and caring environment for our patients. Your children will love the gentle, caring, and professional demeanor of our dentists and dental support staff. We do all in our part to make a dental checkup and cleaning as pleasant as it can possibly be for our youngest patients. Our amenities are also exceptionally calming and create a relaxed atmosphere where patients of all ages can feel at ease. One of the major benefits of children seeing the same dentist as their parents is that the doctor is able to look at all of the mouths of family members to see if there are specific concerns or patterns that relate to a family. This comprehensive knowledge allows dentists to “catch” a problem in younger patients very early because they have seen the signs in their parents’ mouths. Another huge benefit is specifically for parents. Driving around town to multiple dental practices at different appointment times can be a huge burden on a parent’s busy schedule. We offer family appointments so that multiple members of a family can be seen at the same time or with back-to-back appointments. 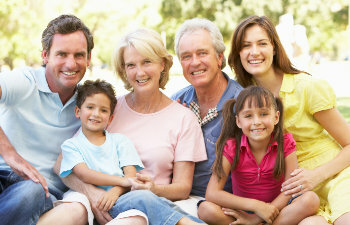 Gold Hill Dentistry is proud to serve entire families with the highest quality dental care. If you are looking for a family dentist in the Fort Mill area, please contact our office today. We look forward to exceeding your expectations in caring for your family’s smiles.